“One nation under God, indivisible, with liberty and justice for all” – these words have a fuller meaning for us this morning in Hawaii. And we have gathered here at Kawaiahaʻo Church to give thanks to God, and to pray for his guidance and protection in the years ahead. Our newspapers lately have been full of much valuable historical data concerning Hawaii’s development, growth, and aspirations. I will keep these stories as long as I live, for my children and their children, for they call to mind the long train of those whose sacrifices were accepted, whose prayers and hopes through the years were fulfilled yesterday. There yet remains the formal expression of our people for statehood, and the entrance of our Islands into the Union as a full-fledged member. I would like today to speak the message of self-affirmation: that we take courage to be what we truly are, the Aloha State. On April 25, 1820, one hundred and thirty-nine years ago, the first Christian service conducted in Honolulu was held on this very ground. Like our Pilgrim Fathers who arrived at Plymouth, Massachusetts, in 1620, so did the fathers of a new era in Hawaii kneel in prayer after a long and trying voyage to give thanks to God who had seen them safely on their way. Gathered around the Reverend Hiram Bingham on that day were a few of our “kupunas” who had come out of curiosity. The text of the sermon that day, though it was April and near Easter time, was from the Christmas Story. Although our grandfathers did not realize it fully then, the hopes and fears of all their years through the next century and more were to be met in the meaning and power of those words, for, from that beginning, a new Hawaii was born. For through those words, our missionaries and people following them under God became the greatest single influence in Hawaii’s whole development – politically, economically, educationally, socially, religiously. Hawaii’s real preparation for statehood can be said to have truly begun on that day and on this spot one hundred and thirty-nine years ago. Yesterday, when the first sound of firecrackers and sirens reached my ears, I was with the members of our Territorial Senate in the middle of the morning prayer for the day’s session. How strange it was, and yet how fitting, that the news should burst forth while we were in prayer together. Things had moved so fast. Our mayor, a few minutes before, had asked if the church could be kept open, because he and others wanted to walk across the street for prayer when the news came. By the time I got back from the Senate, this sanctuary was well filled with people who happened to be around, people from our government buildings nearby. And as we sang the great hymns of Hawaii and our nation, it seemed that the very walls of this church spoke of God’s dealing with Hawaii in the past, of great events both spontaneous and planned. … that statehood will turn Hawaii (as someone has said) into a great big spiritual junkyard filled with smashed dreams, worn-out illusions; that will make the Hawaiian people lonely, confused, insecure, empty, anxious, restless, disillusioned – a wistful people. There is an old “mele” that reminds me of such fears as these, and of the way God leads us out of our fears. “Haku’i i ka uahi o ka Lua, pa i ka lani, ha’aha’a Hawai’i moku o Keawe i hanau’ia … po Puna, po Hilo, po i ka uahi o ku’u ‘aina … ola ia kini, ke’a mai la ke ahi”. We need to see statehood as the lifting of the clouds of smoke, as an opportunity to affirm positively the basic Gospel of the fatherhood of God and the brotherhood of man. We need to see that Hawaii has potential moral and spiritual contributions to make our nation and to our world. The fears Hawaii may have are to be met by men and women who are living witnesses of what we really are in Hawaii, of the spirit of Aloha, men and women who can help unlock the doors to the future by the guidance and grace of God. This kind of self-affirmation is the need of the hour. And we can affirm our being, as the Aloha State, by full participation in our nation and in our world. For any collective anxiety, the answer is collective courage. And the ground of that courage is God. Aloha is the power of God seeking to unite what is separated in the world – the power that unites heart with heart, soul with soul, life with life, culture with culture, race with race, nation with nation. Aloha is the power that can reunite when a quarrel has brought separation; aloha is the power that reunites a man with himself when he has become separated from the image of God within. Aloha consists of this new attitude of heart, above negativism, above legalism. It is the unconditional desire to promote the true good of other people in a friendly spirit, out of a sense of kinship. Aloha seeks to do good, with no conditions attached. We do not do good only to those who do good to us. One of the sweetest things about the love of God, about Aloha, is that it welcomes the stranger and seeks his good. A person who has the spirit of Aloha loves even when the love is not returned. And such is the love of God. This is the meaning of Aloha. I feel especially grateful that the discovery and development of our Islands long ago was not couched in the context of an imperialistic and exploitive national power, but in this context of Aloha. There is a correlation between the charter under which the missionaries came -namely, “To preach the Gospel of Jesus Christ, to cover these islands with productive green fields, and to lift the people to a high state of civilization” – a correlation between this and the fact that Hawaii is not one of the trouble spots in the world today but one of the spots of great hope. Aloha does not exploit a people or keep them in ignorance and subservience. Rather, it shares the sorrows and joys of people; it seeks to promote the true good of others. Today, one of the deepest needs of mankind is the need to feel a sense of kinship one with another. Truly all mankind belongs together; from the beginning all mankind has been called into being, nourished, watched over by the love of God. So that the real Golden Rule is Aloha. This is the way of life we shall affirm. Let us affirm ever what we really are – for Aloha is the spirit of God at work in you and in me and in the world, uniting what is separated, overcoming darkness and death, bringing new light and life to all who sit in the darkness of fear, guiding the feet of mankind into the way of peace. The image shows Rev. Abraham Akaka and the Rev. Glen Balsley leading a procession of dignitaries and Hawaiian civic groups from ʻIolani Palace (where the legislature got the call that Congress had approved admission) to Kawaiahaʻo Church on March 13, 1959. Folks lined the 54-miles of roadway between Selma and Montgomery, Alabama. Thousands of others joined the march. There were actually three marches, collectively called the Voting Rights March from Selma to Montgomery. A catalyst was the killing of Jimmie Lee Jackson, who, while attempting to protect his mother from the troopers’ billy clubs while attending a voting rights rally, was shot point blank by two of the troopers. Seven days later, on February 25, 1965, Jackson died from his gunshot wounds. The third march started after receiving a court order granting them the right to protest without police interference, and with protection from federalized National Guard troops. The marchers arrived in Montgomery on March 24; that night, a “Stars for Freedom” rally was held. Singers Harry Belafonte; Peter, Paul and Mary; Tony Bennett; and comedian Sammy Davis Jr. entertained the marchers. At the final leg of the march, 25,000 people gathered at the steps of the Alabama State Capitol Building, on Thursday, March 25, 1965. The marchers were protesting the hostile conditions, discrimination, and unequal rights to vote, adequate housing and education. One of the leaders said this was not a show, but a war against the social structure of America. Campbell and other Hawaiʻi marchers were not this event’s only ties to Hawaiʻi. This wasn’t King’s only tie to Hawaiʻi. King came to Hawaiʻi a month after statehood and on Thursday, September 17, 1959 delivered a speech to the Hawaiʻi House of Representatives at its 1959 First Special Session. His remarks included the following. The Selma to Montgomery March effected great change; it led to the passage of the Voting Rights Act, signed by President Lyndon B Johnson on August 6, 1965. 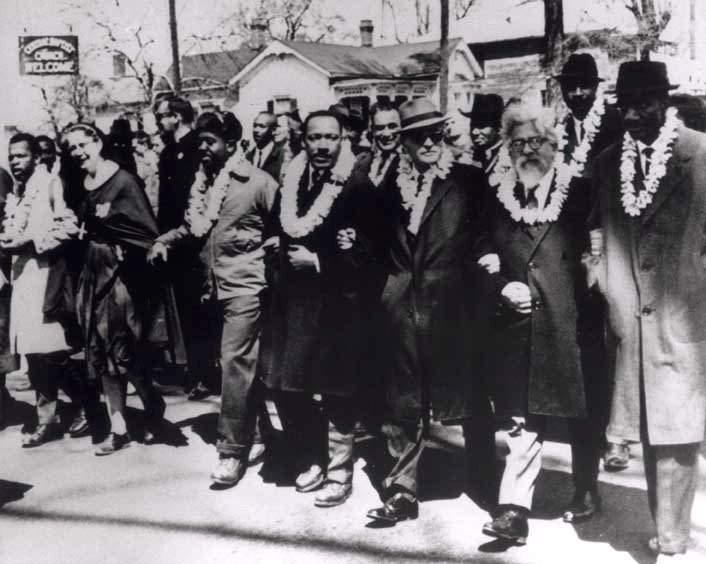 The image shows Martin Luther King and others in the Selma to Montgomery march wearing lei, gifts from Abraham Akaka. In addition, I have added other related images in a folder of like name in the Photos section on my Facebook and Google+ pages.